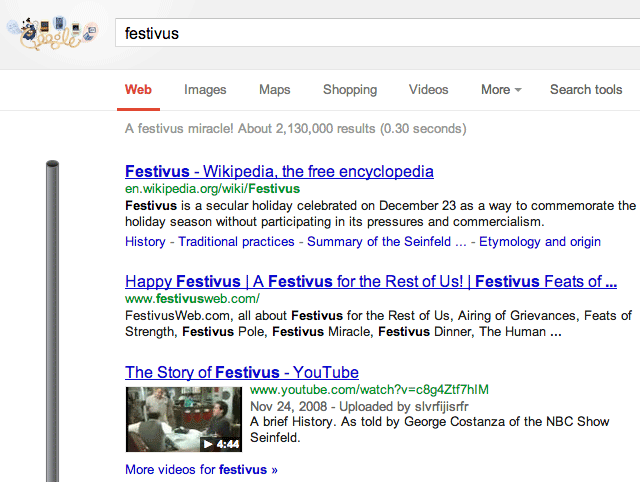 Yea, so we do not have hanukkah decorations yet from Google, despite it already being Hanukkah but we do have [festivus] decorations - well, a pole, in Google's search results despite it not being celebrated until December 23rd. Festivus was a holiday created by writer Dan O'Keefe in 1966. It was designed to give families an alternative to the other holidays but still let them enjoy the holiday season without the pressures and commercialism of the typical holidays. Hence, the bare pole.